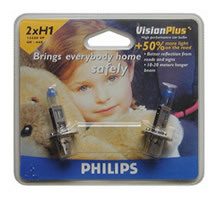 The best headlamp dip and main beam bulbs in my opinion are the Philips Vision Plus bulbs. They are the brightest and have a very small tint on the bulb so that they produce a whiter light. These bulbs are not designed for styling purposes. Adding a set of Philips Blue Vision W5W side lamp bulbs is also very worthwhile as they match the colour of the dip beam. Normal side lamp bulbs look yellow in colour by comparison. Here is an example of what these bulbs look like on my car. I bought my bulbs from http://www.powerbulbs.com/. 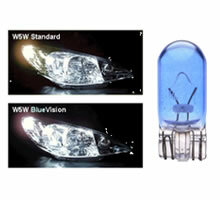 If you buy a set of vision plus headlamp bulbs from then you get a free set of the blue vision side lamp bulbs. 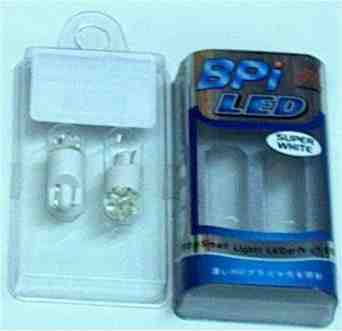 You can also get the LED type of side lamp bulbs. 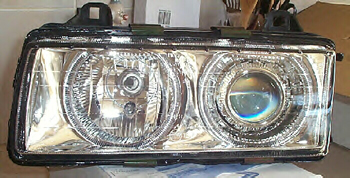 Note that the side lamp bulbs are known by many names such as W5W, 194 and T-10. 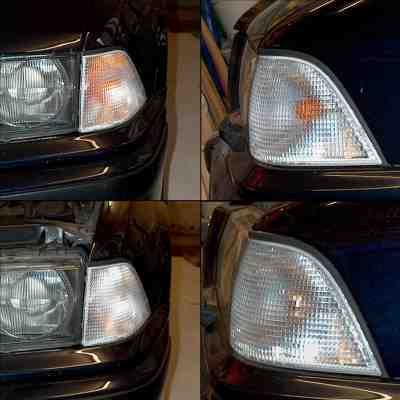 Shown below is a picture of the triple LED white/white bulbs and before/after pictures of them fitted. 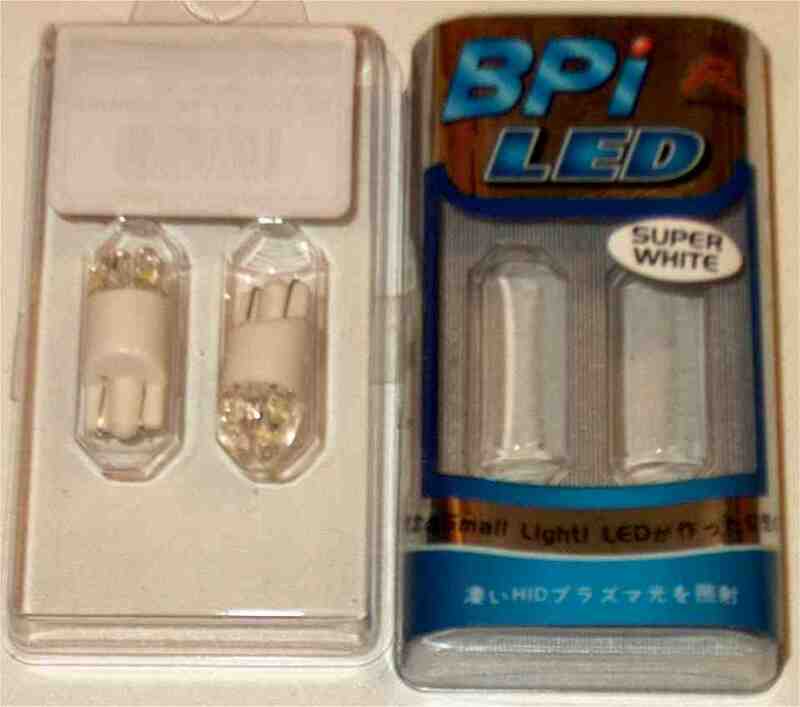 These bulbs are from http://www.xenonvalot.com/ledwedgebulb.html. Click on the pictures above to view larger versions. 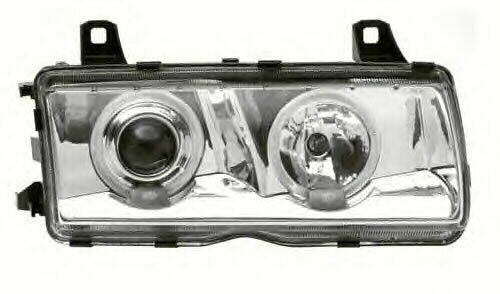 There are a couple of replacement headlamp designs and both of which are sold by BM Town. 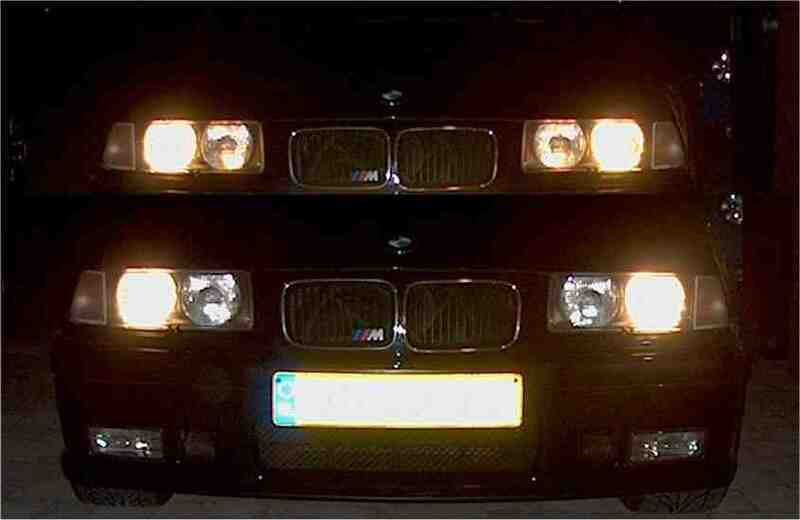 The first ones available were made by Hella who supply BMW with the original units. Below is a picture of their model.Some people find that the rings are a bit small. Below is the newer type which has much larger rings. 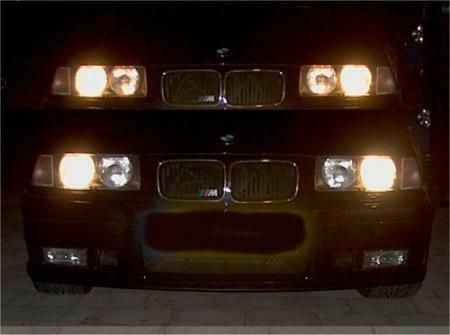 A very common modification is to replace the standard yellow indicators with a set of clears. You then have to fit a yellow indicator bulb which spoils the effect. When buying new bulbs make sure you purchase the 'offset pin' type. 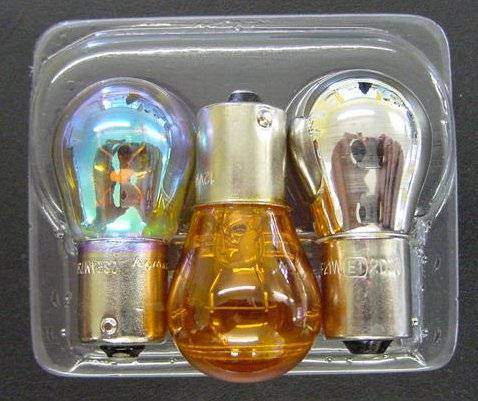 There are three main types of silver indicator bulbs. These bulbs have a silver coating so they look silver when switched off but turn yellow when switched on. The picture below shows the Osram Diadem on the left of a standard orange bulb and a Philips Silvervision to the right. 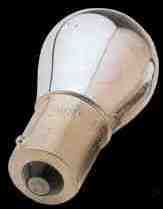 Below is a picture of Silvervision bulbs fitted to a friends car. The top pictures are the original orange bulbs and the bottom ones are with Silvervision fitted.